Egypt's Ahly failed to make the most of the few chances they created to settle for a 0-0 draw with Guinea's Horoya AC in Conakry in the first leg of their African Champions League quarter-final on Friday. The last year's runners-up will be firm favourites to advance to the last four when they host Horoya in the second leg at Cairo's Al-Salam Stadium on 22 September but the Guineans can still fancy their chances of causing a huge upset and ousting the mighty Cairo club. Ahly had the upper hand in a slow-paced first half, with the hosts unable to mount any threats despite their fine passing game amid the deafening sound of the vuvuzela. The Red Devils created some half-chances, with Malian defender Salif Coulibaly and winger Islam Mohareb coming close with two headers. The inviting crosses of Ahly's Tunisian left-back Ali Maaloul proved a constant menace, one of them almost leading to an own goal when Horoya defender Abdoulaye Camara headed just wide of the post while trying to clear the danger on 31 minutes. Ahly's best chance of the half came three minutes later when midfielder Hesham Mohamed's volley forced a good save from keeper Germain Berthe following a half-hearted defensive clearance. Horoya had the better possession in the second half though, pressing hard to pin Ahly in their own half although goal-scoring chances remained scarce. Amadou Wonkoye had a penalty claim waved away by the referee on 58 minutes and Daouda Camara wasted their best chance three minutes later when his mis-hit shot hit the side netting from a tight angle. Despite largely sitting back, Ahly remained dangerous on the break but were let down by some poor finishing from Mohsen. 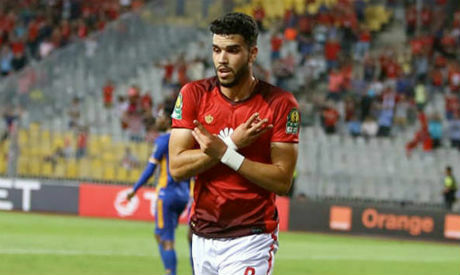 Mohsen, who marked his international debut with a goal in Egypt's 6-0 hammering of Niger in the African Nations Cup qualifiers last week, spurned two clear-cut chances to give Ahly a first-leg advantage. He was thwarted by Berthe in a one-on-one after sending a tame shot and missed the target with an angled shot when played clean through by Moroccan striker Walid Azaro, who was largely a peripheral figure.